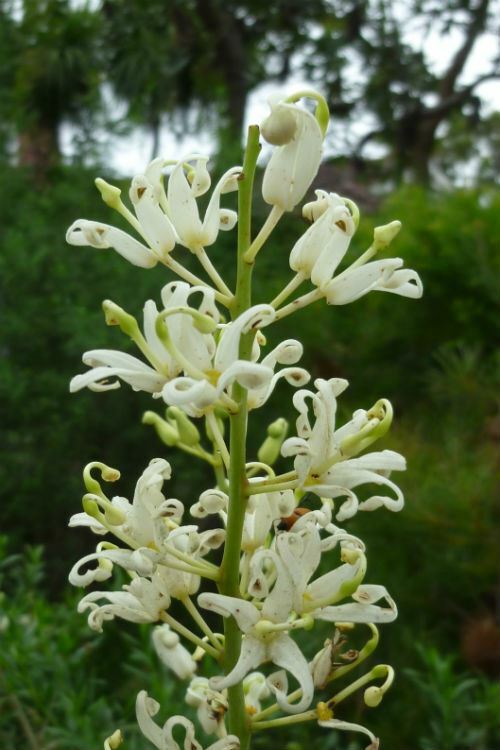 Lomatia silaifolia is found across much of eastern Australia east of the Great Dividing Range as far south as Jervis Bay. It grows as an understory shrub in open forest on sandstone soils. My Lomatia silaifolia plant is now many years old and is growing on a thinnish layer of soil over a clay base. My garden in Sydney’s northern suburbs receives morning and early afternoon sun and my plant is flowering for the first time for many years, due to this year’s ample soil moisture. Lomatia silaifolia is classified as a hardy and long lived plant in most soils and aspects. However I have found it hardly flowers for me if we have extensive dry periods as I do not give it any supplementary watering. Lomatia silaifolia grows 1–2 metres high and about 1.5 metres wide. It has highly pinnate, attractive leaves that are reminiscent of parsley (hence it common name). These leaves are up to 35 to 50cms long and often used in floral art (I am told). The white inflorescences appear in late spring and flower over summer. With my plant, the flowers are about 40cm long and terminal, making an attractive display. Propagation is easy from seed which sets in profusion or from cuttings. It can be pruned heavily and after flowering and I cut the old flowering branches back by 2/3s or so. This promotes growth from its Lignotuber, thus making a bushier and a more attractive plant. English botanist James Edward Smith first described this species as Embothrium silaifolium in 1793. At the time, Embothrium was a wastebasket taxon to which many proteaceae were assigned. It was given its current binomial name by Robert Brown in 1810.